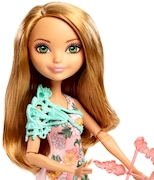 ​ Let imaginations soar with this Ashlynn Ella™ doll -- she’s joined the school’s Archery Club. Accessorized with a bow-and-arrow piece, the Ever After High™ archery dolls are aiming for happily ever afters! Ashlynn Ella™ doll, daughter of Cinderella, has a translucent pink bow with arrow decorated with flowers that she can hold in her hand. She’s ready for practice dressed in a pink training outfit with a colorful floral print and blue textured leggings. Tall blue boots and matching shoulder armor are right on point. Play out practice, aim high in competition or shoot for adventure. The Ever After High™ archery dolls really let the fun fly! Collect them all to expand the storytelling possibilities (each sold separately, subject to availability). Includes Ashlynn Ella™ doll wearing fashions and accessories, plus bow-and-arrow piece. Doll cannot stand alone. Colors and decorations may vary.